Hello lovelies, its Miss Lady Lace here. I’m currently on holiday in America but I’ve been working hard to ensure I can continue to posting videos whilst I’m away. Today I have for you a review on the press on nail kit from Kustom Klaws. This is a temporary nail kit that gives you glamorous nails for 24-48 hours. It’s the perfect way to have your hands looking fabulous for a short amount of time, which is great for me as a performer and pinup model. Kustom Klaws is a fabulous business run by Kenjai, she specialising in the most opulent nail designs. She can create a custom nail kit for you or if you’re after a more long lasting look she offers a full range of nail services. She opens her new salon based in Inglewood from May 1st, and as hosting a very special launch event helping raise funds for the cat haven. 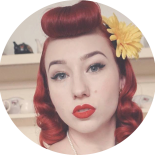 Whilst I’m away I’ll have a blog online every Thursday, so be sure to subscribe to never miss out on one of my vintage videos. This entry was posted on April 11, 2019 by Miss Lady Lace in Uncategorized and tagged 1940's, 1950's, blogger, glamour, miss lady lace, miss lady laces pinup blog, perth, perth pinup, perth pinup blog, perth pinup community, pin up, pinup, pinup blog, pinup blogger, pinup fashion, pinup girl, pinup life, pinup lifestyle, pinup perth, red lips, retro blog, retro girl, retro glamour, the perth pinup community, victory rolls, vintage, vintage blog, vintage blogger, vintage fashion, vintage girl, vintage glamour, vintage perth, vintage pinup blog.